Dr. Eric Hefferon received his advanced doctorate degree in physical therapy from the innovative A.T. Still University. 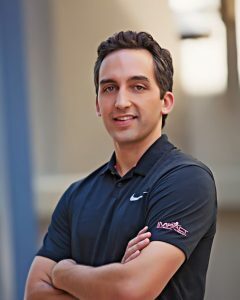 He has been practicing in the west valley for 9 years and has made strong ties to local gyms and medical practitioners. Dr. Hefferon started Impact Physical Therapy due to his passion for an individualized healthcare approach. He knew by creating a clinic that was out of network he could help give patients the results they deserve. His treatment style attracts patients from all over the valley and even out of state. People will travel to seek Dr. Hefferon’s solutions!Dr. Hefferon strives for excellence in all aspects of his life and uses this passion to provide clients, patients and athletes an integrated, functional and engaging experience. He values the amazing ability of the body to heal faster through movement, hands on therapy and progressive modalities. He has honed his eye to quickly and effectively treat patients of all ages and impairments. Immediate results can often be seen with one treatment. Dr. Eric also has a passion for teaching and has had the opportunity to be a guest lecturer at several local universities (Mid Western University & Franklin Pierce University). He was even selected as Mid Western’s Physical Therapy Clinical Instructor of the year in 2015.When Eric’s not working in the clinic or teaching, he enjoys CrossFit, playing basketball, hiking, running, swimming and spending time with his family (Jackson 7 years old, Natalie 5 years old and wife Dr. Tami Hefferon).